PARIS - France has carried out its first airstrikes in Syria, expanding its military operations against Islamic State of Iraq and Syria (ISIS) extremists, President Francois Hollande's office announced Sunday. The strikes make good on a promise to go after the group that the president has said is planning attacks against several countries, including France. Hollande's office said that "France has hit Syria" based on information from French reconnaissance flights sent earlier this month. It did not provide further details. "Our nation will strike each time our national security is at stake," the presidential statement said. France has carried out 215 airstrikes against ISIS extremists in Iraq as part of the U.S.-led coalition since last year, the Defense Ministry said earlier this month. But it previously held back on engaging in Syria, citing concern of playing into Syrian President Assad's hand and the need for such action to be covered by international law. Following a change in strategy announced by Hollande earlier this month, his office on Sunday cited "legitimate defense" evoked in the U.N. Charter to support the move. Hollande, who has ruled out sending ground troops into Syria, has cited "proof" of plans for attacks on France and the growing danger to Syrian civilians, with a large chunk of the population fleeing in a massive exodus. The president's office reiterated on Sunday the French argument that air strikes in Syria were a question of national defense. 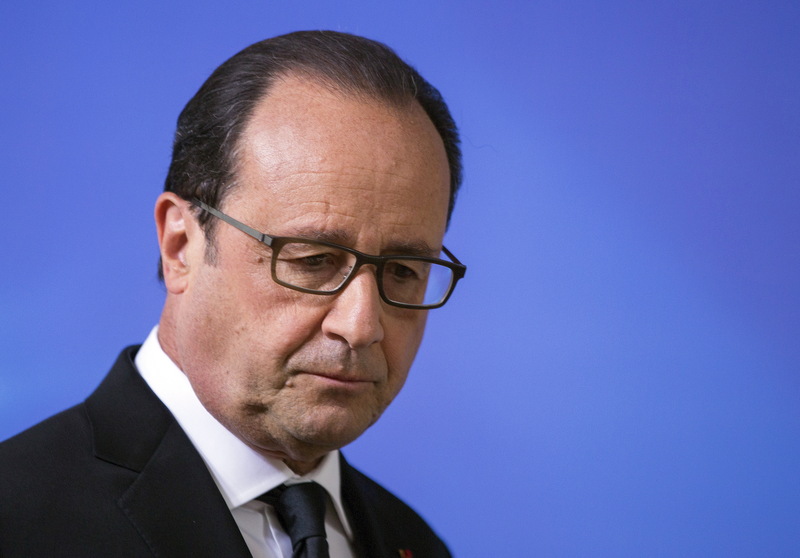 France has already been attacked by extremists claiming ties to ISIS. While no specifics were provided about the location or timing of the airstrikes, Prime Minister Manuel Valls said France was going after ISIS "sanctuaries where those who want to hit France are trained." The goal of the strikes is to "slow, break, stop if possible the penetration of Daesh," Gen. Vincent Desportes said on the iTele TV station, using the Arabic acronym for IS. Hollande, heading to the U.N. General Assembly, stressed the importance of seeking a political solution for Syria. "More than ever the urgency is putting in place a political transition," including elements of the opposition and Assad's regime, Hollande said. Hollande announced on Sept. 7 France's intention to start airstrikes, days after the photo of a dead 3-year-old Syrian boy galvanized public concern about Syrian refugees fleeing to save their lives. In his statement Sunday, Hollande said: "Civilian populations must be protected from all forms of violence, that of ISIS and other terrorist groups but also the murderous bombardments of Bashar Assad."